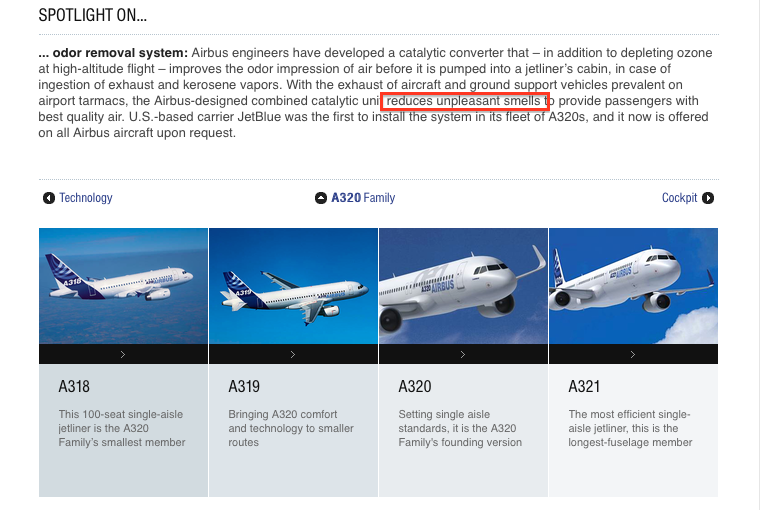 Recently (early 2016) Airbus announced on their official A320 family aircraft webpage that they now offer a filter device that could filter out «toxic fumes». One may wonder why the worlds leading aircraft manufacturer designs and offers such a filter device to its customers when in fact there is no problem and has never been any… This is at least what PR people with Airbus and their own experts have always claimed in the recent years. So: «toxic fumes» become «unpleasant smells». – Must be some sort of aviation «newspeak» derived from famous British novelist George Orwell. Meanwhile Airbus has announced during the 2016 Farnborough Air Show that future A320 neo aircraft will become available with non-bleed technology. Standing ovations to the management of Airbus, but this won’t resolve the issues with those who claim that they have already become victims of contaminated cabin air and it also seems that the airlines do not feel any need to change to this technology and change previous orders. Nevertheless it would be fair to say that Airbus is fully aware of the situation an the emerging problems and likewise Boeing for some time already. But while Boeing has actively abandoned the problem of contaminated cabin air with its Boeing 787 «Dreamliner» the Airbus counterparts seem not to be «bleed-free-ready» yet. Devices that could do the job have been developed, e.g. by Liebherr Aerospace for some time now. Advanced filter technology would also be available including sensors that would alarm pilots in case of something coming up the bleed air lines from the engines that would not be considered «desired» in the breathing air of the aircraft. But until today no civil passenger jet is required to constantly measure the air quality on board, while important engine parameters and even the failure of a toilet flush motor would be transmitted to the aircrafts home base, at least every minute. Airbus declined to be interviewed by Tim van Beveren about this subject.